The new initiative Trees by two Dutch broadcasting stations VPRO and Human, responds to these developments. This blogpost will give a SWOT-analysis in the current media market of this new initiative . Strength: Trees gives complete insight in the journalistic process. This entails that the journalists will share their choices, considerations and insecurities with their audience and they will make use of their input. This is a great strength since trust in journalists decreased. This transparancy is likely to have a positive impact on the degree of trust by the audience. Another strength is that Trees responds to the changing media use of young people since Trees can reach them through their mobile phones and headphones. Weaknesses: Although Trees aims to reach a young audience through the use of an app and by presenting their stories as podcasts, they still have no plan on how to come up with stories that would specifically attract a younger audience. Opportunities: Trees should incorporate their social media pages to enthousiast a young audience, and keep them up to date with any progress. Threats: A threat to Trees could be that they will not succeed to engage the audience. If this happens, the whole point of Trees will go to waste. Anderson, C. W., Bell, E., & Shirky, C. (2015). Post-industrial journalism: Adapting to the present. Geopolitics, History and International Relations, 7(2), 32. A couple of weeks ago, we had a guest speaker for our course Journalism and Production Studies: he worked for the Dutch newspaper Algemeen Dagblad (AD). He showed us a visualisation of different social media communities and their communication on Twitter in the Netherlands and Belgium. Groups like right-wing populists, more elitist left-wing communities and YouTubers were separated from each other by different colours. A huge part of the online population and communication turned out to be right-wing and populist. The guest speaker also showed us a graph that visualised the political focus of different Dutch news media. As it turned out, a large majority of these news sources were on the left side of the political spectrum. This can be considered problematic: right-wing populism plays a big role in the online world. In fact, a huge potential audience for news outlets is being ignored by journalists. This might be explained by the fact that most people who choose a career in journalism have a left-wing bias (I’d love to talk more about the reason for this bias, but I have to respect the word limit). In this week’s literature, many views were expressed about the question how journalism can survive in the future. Burns and Matthews focus on the need of innovative organizational structure; Van Der Haak discusses options like “visual storytelling”, crowd funding and automated content; Naldi and Picard underline the need of organisational objectives based on previous experiences. However, nobody speaks of the specific option to bridge the cultural gap between the average journalist and a large potential audience. Maybe journalists should step out of their left-wing bubble and try to create content for people who are on the other side of the political spectrum. After all, I think theye’s missing out on a lot of money. Burns, Lynette Sheridan, and Benjamin J. Matthews. ““Post-industrial” journalism as a creative industry.” World Academy of Science, Engineering and Technology, International Journal of Social, Behavioral, Educational, Economic, Business and Industrial Engineering 11.6 (2017): 1533-1541. Naldi, Lucia, and Robert G. Picard. ““Let’s Start An Online News Site”: Opportunities, Resources, Strategy, and Formational Myopia in Startups.” Journal of Media Business Studies 9.4 (2012): 69-97. Van der Haak, Bregtje, Michael Parks, and Manuel Castells. “The future of journalism: Networked journalism.” International Journal of Communication 6 (2012): 16. In “Media Manipulation and Disinformation Online”, Alice Marwick and Rebecca Lewis discuss the role of memes in the current media landscape and society. Their focus lies on the manipulating effects of memes and how memes are used by far-right groups to increase visibility or attention for certain topics. I’m definitely not a fan of far-right internet communities and their opinions. However, can’t more left-wing communities also be accused of “attention hacking” in politics? What about the memes they made about Obama and Biden? Of course, there might not have been deliberate attempts to spread disinformation. 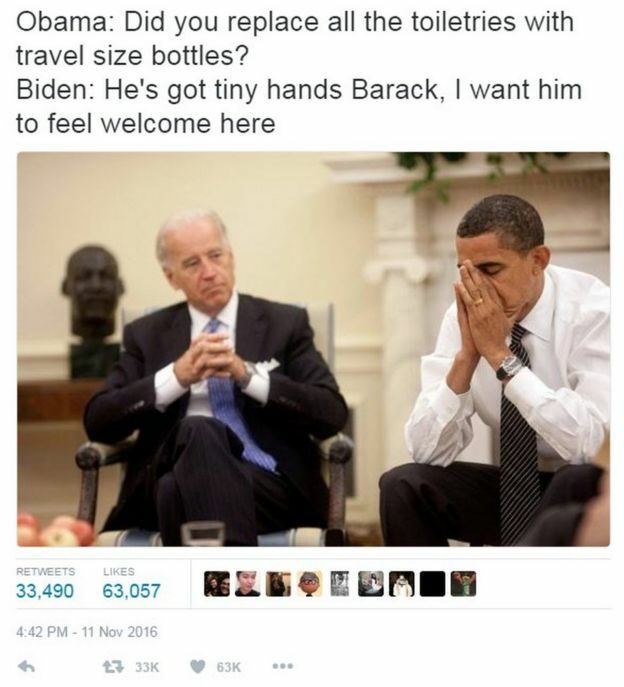 But these memes definitely made Biden and Obama more popular than ever, through humour platforms like Imgur, even among people who weren’t interested in politics. Most of the quotes used in the memes were “fake” – they were fiction – but they worked. It even got to the point where Biden shared his favourite memes about himself and Obama with the world. “In essence, they’re all true”, he said to The Hill earlier this year. I am not surprised about this effect. Memes are extremely “shareable” on social media and go viral easily. More easily than informative, well-structured background articles on politics, at least. They’re catchy, you can “consume” them in a blink of an eye and you don’t even have to click on a link. I think we should start realising that memes in themselves are not just funny images showing some fiction. They have the serious potential to form and influence public opinion, even in cases where they are simply meant as entertainment. It would be interesting to use meme formats to share more “objective” information. Although, I have to admit: I’m not sure if those could still be called “memes”. Marwick, Alice, and Rebecca Lewis. “Media manipulation and disinformation online.” New York: Data & Society Research Institute (2017). The lack of diversity in Dutch news rooms has been a point of discussion for decades. The average journalist is supposedly a white, highly educated male who has a centre-left political preference. Ethnic minorities, women, people who had lower education than university and right-wing people are hardly represented in the newsrooms. You can read it everywhere. In 2014, Deuze said in an interview with Trouw that there are “not enough clashes” in newsrooms, because the journalists all have a similar socio-economic background and share the same values. Earlier this year, Klaske Tamerling told Red that there is still characterized by a “male culture” and that women are “scarce” in media management. There’s an issue, however. The socio-economic characteristics and political preferences of Dutch journalists have not been the subject of extensive research for a while now. Neither are there any recent, hard numbers of the male-female ratio in newsrooms. In 2015, NRC discovered that only 3 per cent of the editorial workers at NOS, RTL Nieuws, Nu.nl and several Dutch newspapers had a non-western background: that’s something we know. But apart from that, we don’t know much about the journalists working for these media now. The research in which Deuze extensively showed the homogeneous characteristics of news rooms in the Netherlands (most journalists being white, male etc. ), dates back from the time when the Dutch still paid with the florin. Why is nobody researching this topic anymore? Are journalists afraid to undermine their own profession, while academics are simply not interested enough to find out? I mean, the relevance of this topic in media production can’t be denied, so somebody should study it. Maybe I should start reading Dencombre’s “Good Research Guide” and go find things out myself. Denscombe, Martyn. The good research guide: for small-scale social research projects. McGraw-Hill Education (UK), 2014. We come from the future! Gizmodo, being an offshoot of Gawker media, innately has a contemporary if not “young” aesthetic. Its content leans towards zany—where nerd meets culture and then of course, politics. They’ve earned enough clout now to become a familiar media outlet and I think a lot of people feel comfortable getting news from there as a result. However, having known people who have worked for Gizmodo, it is known that they employ young, inexperienced writers, often whom come from no journalism background and go on to do other irrelevant things– and while that is a wonderful opportunity, it sometimes shows. That, and their crazed demand for a certain amount of articles from each journalist per day—this almost seems like too easy a set-up for quantity of quality. Since Gizmodo has a technology and design contingent, as well as even sci-fi, I think it stands a part as a niche “nerd” outlet, kind of merging otherwise previously societally ostracized interests with the mainstream news. Burns, L.S., Matthews, B.J. “Post-Industrial Journalism as a Creative Industry.” International Journal of Social, Behavioral, Educational, Economic, Business and Industrial Engineering 11.6 (2017). Online. The journalistic platform Blendle was launched in 2014 by Alexander Klöpping and Marten Blankesteijn. They came up with the idea of an online Kiosk, in which you pay per article. An innovative journalistic start-up that was a result of frustration of the traditional consumption of news. Four years later I want to look at the strengths, weaknesses, opportunities and threats of Blendle in the current media market. First of all, a strong characteristic of Blendle is that they put their consumers first. A good example is their renewal of services. At the start of this year they introduced Premium-service, which made the daily newsletter and choice of articles even more personal. Also, readers have input through feedback about articles and services. A weakness can be seen in their financial model in relation to their partners. In the past year, the NRC and Follow the Money dropped their cooperation because their participation on Blendle wasn’t profitable for them. And this is also where a threat for a journalistic platform such as Blendle arises. If quality papers are resigning and their will be less content available, can you keep your audience satisfied? The biggest opportunity and (also challenge) for Blendle is to keep readers interested in their platform and work together with them. I think they can do that by interacting even more with their public and talk with media-experts about innovation, but also stick to idea of providing readers with good journalism. Under conditions of a changing media culture that is more interactive and co-creative (Jenkins, 2006), media professionals as well as their audiences are increasingly (expected to be) working together, to converse and co-create. What will happen in the future? I’m sure Blendle will keep on surprising us. Deuze, M., Witschge, T. “Beyond journalism: Theorizing the transformation of journalism.” Journalism (2017).